Our Book is Now Available for Preorder in the hardcover form. There will be a Kindle Edition available later as well. This entry was posted in Nerdy Tumbleweeds and tagged axolotl, developmental biology, embryology, neat science on January 12, 2016 by tumbleweedstumbling. The Book Is Off to the Publisher! 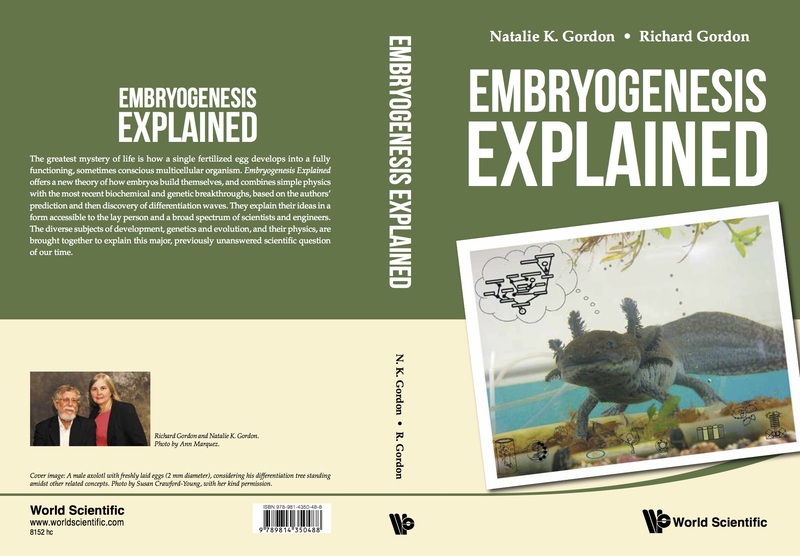 This entry was posted in Nerdy Tumbleweeds and tagged academia, axolotl, Book Cover, developmental biology on October 24, 2015 by tumbleweedstumbling. Gastroliths – How I Learned to Stop Worrying and Love Gravel. If you read anything about keeping the axolotl as a pet you are bound to encounter the stern admonition that you must never, ever, keep axolotls on gravel. Axolotls will accidentally swallow the gravel, get a gut impaction and die. Axolotls kept on sand, the “ideal” medium also can’t be trusted to not try to swallow anything else in the tank from plastic plants to pieces of your water filter. Keep that tank bare or they will die. Or will they? In all aspects of human life there is received wisdom. Some of it is very important. Look both ways before you cross the street. Cars can’t stop as fast as you can step out so if you don’t you might die. This was received wisdom of my childhood. Don’t open an umbrella in the house because it brings bad luck. That was also received wisdom. One is true, the other is just superstitious nonsense. The key question is how to tell the two apart and that is what being a scientist is all about. Naturally, when I (Natalie) got my first axolotl I was determined to do everything right and so Cris Martin (the other person who helped set up that first axolotl colony at University of Manitoba) gathered oversized rocks to layer over the under gravel filtration. The axolotls had other ideas. We had rocks even as big as the axolotls but no matter how diligently we rearranged big rocks, the animals would dig and squirm and fuss until they got at the gravel. It drove us bonkers. They endlessly dug and fussed and dug until they could get at the gravel. After two years of this and no fatalities, we kind of gave up. The bigger rocks sunk to the bottom and the turkey grit ended up on the top and the axolotls got as much access as they wanted. I felt guilty about the risks we were taking, so I contacted every single person I could find who was publishing the anti-gravel advice. Not one person could personally tell me of a single fatal case they knew of because they all avoided gravel and kept their animals on sand. I finally did find one person who could actually relate a death due to gut impaction. I asked her to describe how she determined this. The animal stopped eating, it died and when they did a necropsy, they found the gut full of gravel and mucus. I then asked the critical question. How did you know it was gut impaction and how did you know the gravel caused it? The animal stopped eating and then died and the gut was full of gravel. It was obvious. That was the answer. And here you see a failure to distinguish between correlation and causation. Correlation is simply two things occurred at the same time. They may or may not be related. A correlation may indicate a cause but It might just be coincidence. Causation means doing A caused B to happen or in this case, eating gravel caused gut impaction. Or did it? There was no proof of causation only evidence of correlation. Meantime, generations of pet/lab axolotl keepers were assiduously keeping gravel from the animals based on what was, as far as I could tell, a single report of a single expert who had confused correlation with causation and published it. So we stopped worrying but, being mere undergraduate students, we also didn’t tell anyone who was “an expert” with PhD about the gravel. It all came to a head when our lab began a radiology experiment to learn about using ultrasound to view limb deformities in fetuses and very young children. The problem is that you need to be able to monitor limb development in certain situations but no one wants to expose kids to a whole bunch of x-rays. Also kids have soft bones that are not calcified which makes it harder to image them with x-rays. Axolotls regularly bite each other on the leg as part of their whole social structure and the loser often ends up having to regenerate a whole limb. Axolotls also have cartilage not bone, just like young humans. We took advantage of this natural behaviour to do a comparison of imaging with ultrasound versus x-rays of regenerating limbs. The results were that ultrasound works remarkably well. The work included the x-ray picture above. Look at that belly just packed full of gravel! We followed several animals over two years. Every time we took their x-ray or ultrasound, they had a belly full of rocks. They were also clearly healthy and normal. So what about the whole “Never keep axolotls on gravel in case they die of gut impaction” question? As a scientist, one should never just accept received wisdom at face value, and so, since I was the axolotl expert in the collaboration, I got to do a full literature review on the topic. The result was that I learned there is absolutely no proof whatsoever that axolotls get gut impaction from eating gravel. I also learned all about gastroliths. A gastrolith is a rock ingested by an animal on purpose and carried around in the gut to provide stability, a weighted keel, while swimming. A clever pair of paleontologists explained that the little piles of rocks consistently found in the belly area of fossils of plesiosaurs were gastroliths. They pointed out an animal without a keel could compensate for the lack of a keel while swimming by having weight in the gut. Without such a weight, you end up rolling in the water as soon as you pick up any speed. Fish have a swim bladder that makes the top lighter than the bottom and they have fins. Plesiosaurs swallowed rocks. After that, I found examples all over the scientific literature of gastroliths including a complaint from a fellow who was dissecting frog tadpoles for an unrelated reason about how you had to be careful because the tadpoles had little rocks in their guts that can wreck the very expensive fine blade of a scientific microtome. Even seals apparently swallow gastroliths. I did one final test. Baby axolotls swim, continuously hunting prey. We kept our baby axolotls in 25 gallon “pond tanks” chock full of things delicious (if you are an axolotl) to eat like Daphnia. My hypothesis was that the wee little 2-3 cm axolotl baby that has just grown front and back feet should really need gastroliths and therefore have a strong instinctive drive to find them. I put a tiny 3cm dish of fine coloured gravel in one bare corner of the 25 gallon tank, far from any food. Sure enough, I kept finding the little guys sitting on the gravel. When I offered them an assortment of sizes, each size a different colour, they would take the tiny rocks in their little mouths, wriggle their mouths in the cutest axolol style smile and swallow some and spit out others. I could see the coloured stones in their transparent guts and they almost always took stones of one colour. They even have a size preference. I also found mucus and waste with stones all over the bottom of the tank. So it appeared the baby axolotls ingested the gravel deliberately and passed it at random. So gastroliths don’t stay in the gut. They pass through the gut and the animal has to constantly seek out fresh gravel. Gizzards of birds probably evolved for more efficient retention of gastroliths. I also compared the swimming behaviour of baby axolotls who had access to gastroliths with those who did not. The ones with bright coloured gravel swam straight and fast. The others often missed prey because they rolled out of control on the big rush. The take home message is this. Axolotls have a strong instinctive urge to swallow gastroliths. All those stories of pet keepers who have lost animals who swallowed plants and garbage probably had animals desperately trying to satisfy their instinctive urge to eat gastroliths. (I say “probably” because I don’t know for sure since I can’t read their minds.) Sometimes, even in science, received wisdom and the consensus of the experts is just plain wrong. Question everything, even and maybe especially, from the experts in science. Always go back and evaluate the original data for yourself. Scientists are first and foremost human beings and they are subject to all the failures of human beings. Oh, and you CAN keep your axolotl on gravel and they will probably be happier for it. This entry was posted in Nerdy Tumbleweeds and tagged amphibians, axolotl, gastroliths, pets, salamanders on September 10, 2015 by tumbleweedstumbling. Our favorite model animal is a salamander, called the axolotl (Ambystoma mexicanum). The axolotl is a big salamander, typically 20 centimeters as an adult, although they can often be a lot larger. Most of us have watched water dwelling frog tadpoles grow up, lose their tails and gills, and become air breathing adults. Most salamanders do the same thing. The axolotl is a neotenic salamander. Neotenic means it never goes through this metamorphosis to become a land dweller. The axolotl remains in the larval state, complete with external gills, even as a breeding adult. 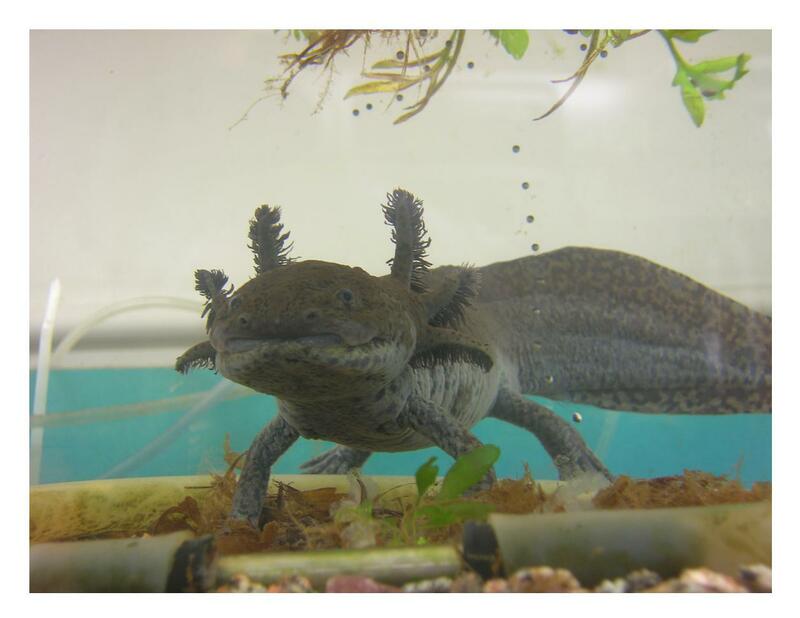 Neoteny is a recent adaptation in evolutionary time for the axolotl, and with a little artificial hormonal prodding in the laboratory, the axolotl can still transform into a regular looking terrestrial salamander although some will not survive the transformation. The axolotl can also cross breed and produce fertile offspring with its closest salamander relative, the tiger salamander (Ambystoma tigrinum) which does metamorphose naturally. The axolotl is a typical salamander, despite its fully aquatic life cycle. During the evolution of higher species on earth, animals split into two broad groups, the invertebrates like insects and sea urchins and the vertebrates. All four legged vertebrates passed through, i.e., branched off from, an axolotl-like ancestor. Frogs went off on their own separate branch. Axolotls look very much like the earliest salamander fossils that have been found, so they haven’t changed much in appearance. Our common ancestor is likely to have had the many wonderful properties that are still available for study in axolotls. Axolotls, like all vertebrates including us, have a notochord. The notochord is a stiff rod of tissue that forms very early in embryogenesis and acts as a support structure underlying the region that will become the spine. The notochord preceded the spine in evolution. In more phylogenetically basal (more primitive) organisms, the notochord persists through the adult stage and it is the primary axial support running from the base of the brain all the way to the end of the tail. In most vertebrates, including us, the spine forms above the notochord and the spine takes over the function of main axial support. The notochord forms the nucleus pulosus where it acts as a shock absorbing material and separates the vertebrae. The axolotl is native to Lake Xochimilco which once existed where Mexico City is now. Unfortunately, it is endangered, and possibly extinct, in the wild due to habitat destruction. Fortunately it has been used as a laboratory animal for over 100 years and is a popular pet and so it will likely not go extinct anytime soon, and if the day comes their habitat is restored, they can repatriated to their wild home. The axolotl takes two years of tending to go from an embryo to a fertile adult. The axolotl has a relatively huge egg. The egg is 2 mm in diameter, or 2000 µm, compared to 70 µm for a human egg. With the axolotl embryo’s large cells it has proven easy to watch every surface cell with a modest microscope. Another one of the axolotl’s marvellous properties is that they have a tremendous capacity to regenerate. They are aggressive towards one another, and a large axolotl will bite off the leg of a small one. While the latter is slowed down and less of a competitor, it nevertheless regenerates its leg in 6-8 weeks. Jaws regenerate too. Skin wounds heal without scarring. If they lose their tail or a even part of their heart they will likewise regenerate, as does a severed spinal cord. A chunk of brain may be successfully transplanted and in a closely related salamander even memory has been transplanted. If you ever read Frank Herbert’s science fiction you may recall the Axlotl tanks. These were used to regenerate an entire new human clone from a cadaver or even a piece of a cadaver and no doubt he got the idea from the marvellous regenerative properties of the axolotl. Did he misspell the word on by accident or on purpose? It is a strange word. Axolotl is from the Nahuatl language of the Aztec civilization and so looks foreign to English eyes. Axolotls make fascinating pets. Famous, the axolotl pictured above, is the pet of engineer, artist and teacher Susan Crawford-Young. In addition to her other talents she takes a good picture and she kindly gave us a picture of Famous which will be incorporated into our book, Embryogenesis Explained. This entry was posted in Nerdy Tumbleweeds and tagged amphibians, axolotl, Frank Herbert's Dune, pets, salamanders on September 8, 2015 by tumbleweedstumbling.